*On Saturday, November 2 at 11:00 am a Solemn Mass in the traditional Roman form for All Souls will be celebrated at St. Joseph Parish. 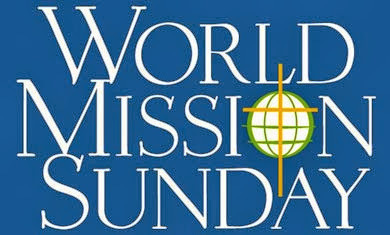 People in remote villages, towns and cities through the witness and work of missionaries and local priests. Children, the elderly, refugees, the sick and orphans through the service of Religious sisters and Brothers to bring the Gospel to the poorest of our human family. Catechists proclaim the message of hope and peace that only Christ can give. Please offer prayer for the work of the Church today in the Missions of Africa, Asia, the Pacific Islands and the remote regions of Latin America. 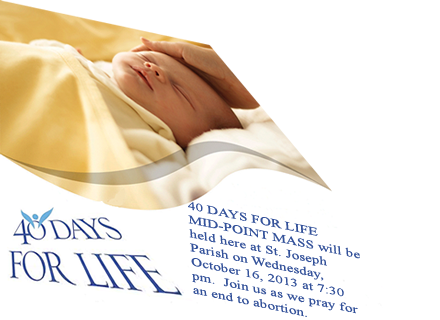 40 DAYS FOR LIFE MID-POINT MASS will be held here at St. Joseph Parish on Wednesday, October 16, 2013 at 7:30 pm. Join us as we pray for an end to abortion. This Feast was established by St. Pius V on the anniversary of the naval victory won by the Christian fleet at Lepanto on October 7, 1571. The victory over the Muslim forces was attributed to the intercession of Our Lady whose aid was invoked through praying the Rosary. Today, together we confirm that the Holy Rosary is not a pious practice banished to the past, like prayers of other times thought of with nostalgia. Instead, the Rosary is experiencing a new Springtime. Without a doubt, this is one of the most eloquent signs of love that the young generation nourish for Jesus and his Mother, Mary. In the current world, so dispersive, this prayer helps to put Christ at the centre, as the Virgin did, who meditated within all that was said about her Son, and also what he did and said. When reciting the Rosary, the important and meaningful moments of salvation history are relived. The various steps of Christ's mission are traced. With Mary the heart is oriented toward the mystery of Jesus. Christ is put at the centre of our life, of our time, of our city, through the contemplation and meditation of his holy mysteries of joy, light, sorrow and glory. May Mary help us to welcome within ourselves the grace emanating from these mysteries, so that through us we can "water" society, beginning with our daily relationships, and purifying them from so many negative forces, thus opening them to the newness of God. The Rosary, when it is prayed in an authentic way, not mechanically and superficially, but profoundly, it brings…peace and reconciliation. It contains within itself the healing power of the Most Holy Name of Jesus, invoked with faith and love at the centre of each "Hail Mary".